Apps4Learning is an innovative program adopted from a similar program run by TechU.me in Ottawa, Ontario. Apps4Learning provides students with the opportunity to cross-collaborate on an initiative to build educational apps that complement the school curriculum. High school students collaborate with elementary school students to develop, design, and create an app that is curriculum based. The elementary students are the clients who create the app idea, company name, and logo; the high school students do the app development and programming. 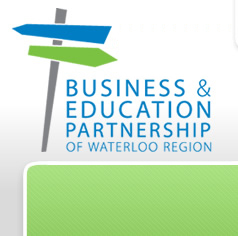 Throughout the semester, volunteer mentors from the Waterloo Region visit the high school class they are working with to help them through the product development cycle. This program is made possible through support from SAP Labs Canada. What is the purpose and outcomes of this program? Apps4Learning allows students to explore a real world career path in tech. Through just a few shorts months, I saw some students who had no concept of app development or managing clients deal with the hardships of product development, software lifecycle, and meeting deadline. I think these are skills that any student will be glad to pick up. These are skills that any employer going forward will desire and they are part of the key skills to success in life. If you are a App Developer and would like to mentor a high school class in this program, please contact us!